small bump between the legs, this is the cloaca where eggs and waste are passed. They do not sing or call out like males do, but they do answer back which is extremely unique to the animal world. (Most females of any species rarely answer back.) The female frog makes a soft rapping call for acceptance or a slow ticking call for rejection. When a male is ready to breed he will begin calling out for a female. She will answer him back by clicking softly. He will grasp her from behind holding her right above her thighs. He then will squeeze her until she begins to lay eggs, and fertlization takes place outside the body. Females can lay hundreds of eggs at one time and they will stick to everything all over the tank. If not removed shortly they will eat them. 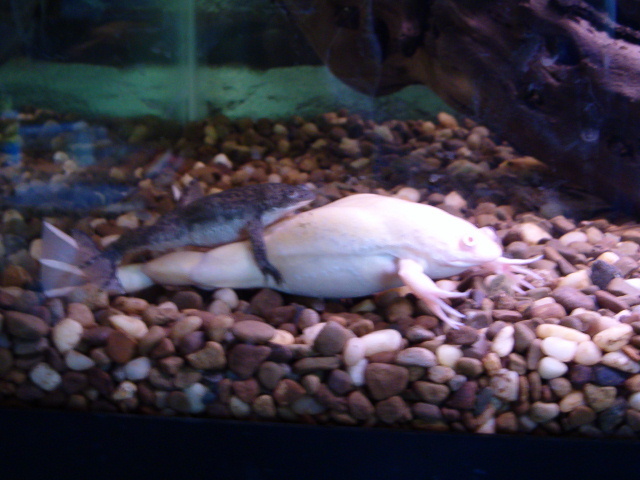 The condition of the tank is crucial for successful breeding. They don't like it too hot or too cold, room tempurature is perfect. A good way to "set the mood" is to do a 30% water change and refilling the tank with cool water. This will fake the male frog into thinking it is "spring rain" and he will being to call for a female. The quiter and darker the tank is the easier it is for them to breed. I suggest doing a water change with cool water in the evening and then shutting off the filters and lights. The darkness and the quiet will make them feel comftorable and secure. Females should only be bred once every 3 months (4 times a year). 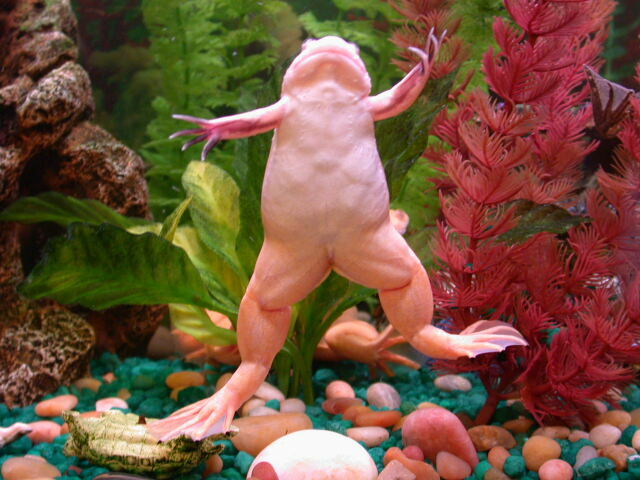 It is possible to over breed frogs to the point of death. 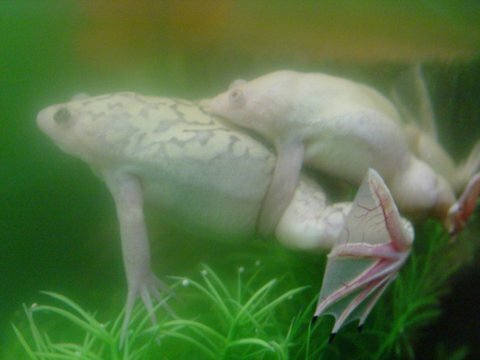 You may need to seperate frogs that keep trying to breed. No female should be bred before a year and a half in age to ensure quality eggs and maturity. In the event you wish to have planned mating of frogs do consider the following. 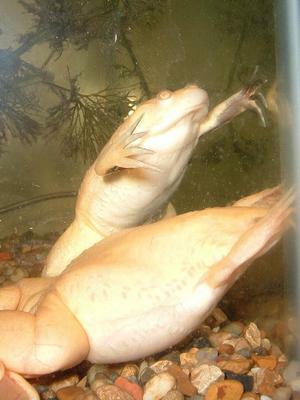 Frogs purchased from the same petstore, from the same tank, are most likely related. 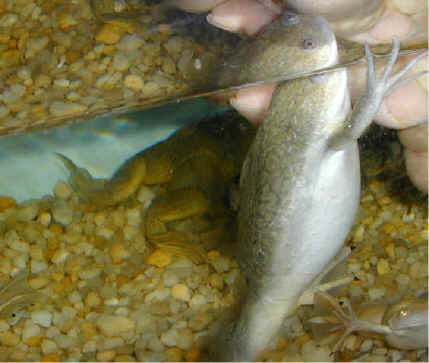 Breeding these frogs together creates a small gene pool and results in high death rate among tadpoles, deformities in tadpoles and froglests (such as twisted spines), death in froglets shortly after metamorphasis, a weakened ammune system, and a shortned life span due to a weak ammue system. THINK AHEAD! What do you plan on doing with all the froglets you raise? This could be hundreds of frogs you are responsible for. Check with local petstores ahead of time to make sure they are willing to take in the froglets, either for free, for a small fee or in exchange for store credit. 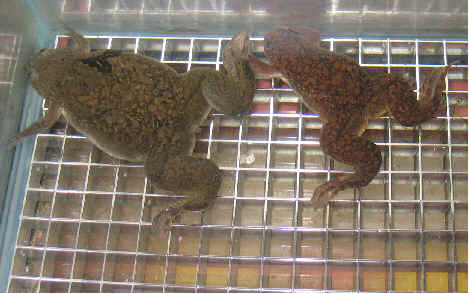 Sometimes female frogs will lay eggs without a male being present. The eggs are not fertilized and she will probably eat some of them. Scrape them out of the tank and dispose of them. 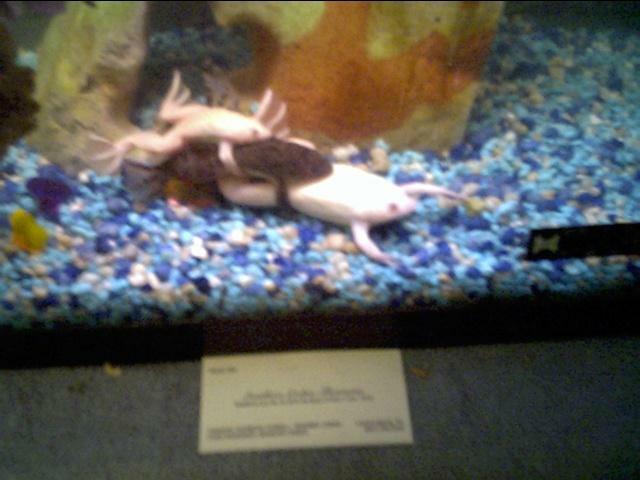 In this picture the female is the bottom frog, and the other two are males. Sometimes females will amplex with other females and males with other males, and then sometimes an extra frog or two will decide to join. I had two females that would amplex after every water change. Although not very common, this behavior can happen but there is no cause for alarm. I'll update this page frequently so check back often!